The question of Indian IQ is a big puzzle. Far trickier than China’s IQ which I think I’ve basically figured out (101-102 today; 106-108 genetic ceiling). The PISA-adjusted IQ of India – as extrapolated from the states of Tamil Nadu and Himachal Pradesh, which are relatively rich and are reputed to have good school systems by Indian standards – is a miserly 75.4; Richard Lynn, in his latest estimates based on an international standardized test from 1970 and a more recent TIMSS study in the states of Rajasthan and Orissa is 82.2. The chart above compiled by Steve Sailer from Lynn’s data on numerous IQ tests also indicates it is the low 80’s. In my opinion the low 80’s figures given by the IQ tests is more accurately reflective of today’s Indian g because PISA is after all an academic test and Indian schools leave a lot to be desired. Regardless, the differences between Indians, and East Asians and Europeans, are huge. India is in fact at the upper level of sub-Saharan African IQ which typically ranges from 65 to 80. There are lots of factors holding India back: Malnutrition (which is on average perhaps worse than in sub-Saharan Africa), vegetarian diets, poor education system, a moderately high rate of consanguineous marriage. But all that said the sheer size of the gap makes me skeptical that all of it is down to environmental factors alone. On the other hand the average IQ of Indian immigrants to the US is an Ashkenazi Jewish-like 112. Ramanujan was assessed by G.H. Hardy, no lightweight himself, as the most gifted mathematician of his age. Going back further in time, India has a pretty stunning religious, linguistic, mathematical, and philosophical heritage. Only a continuous stream of very high IQ individuals could have both created and sustained such a heritage. Finally, we also know that India remains a heavily caste based society, despite very vigorous government attempts to legislate it away. They don’t tend to intermarry. They eat different foods. And they do appear to differ markedly in IQ. Brahmins occupy a lot of the intellectually demanding positions (I cannot find the source but I recall reading that almost all members of India’s version of the Manhattan Project were composed of Brahmins). A lot of the (super high IQ) US Indian immigrants appear to be Brahmins. Meanwhile Indian immigrants to Britain or those who live as diasporas in sub-Saharan Africans tend to under-perform Anglo whites by about 0.5 S.D. These are the “Patels”, etc were talking about who are mostly Vaishya or Shudra and who constitute the vast bulk of India’s population. If they are typically scoring in the low 90’s and India’s average is in the low 80’s then *that* difference can plausibly be ascribed to the Flynn Effect. Many cultural achievements (philosophy, religion, literature) that up until the Early Modern period compared respectable with those of European, Near Eastern, and East Asian civilization, but were much less prevalent in sub-Saharan Africa. Levels of inequality in Early Modern times that were higher than in Western Europe, China, or Japan even though on objective factors (e.g. lower levels of land stress) should have been lower. The caste-based nature of traditional Indian society that the government has been powerless to stamp out. What I conclude from this is that in terms that would be familiar to Westerners: India is a nation of Gypsies and Jews. Over the centuries, Brahmins have been selected for intelligence. They were expected to master requisite texts and those who couldn’t handle it dropped away. These selective pressures did not apply to the lower castes who made up the vast majority of the population. The reason for why India split along caste lines was because of Hinduism and its origins as a religion/ideology to hold society together under the boots of the conquering light-skinned Aryans who brought down the original Harappan civilization (indeed 4 millennia on Bollywood still glamorizes lighter-skinned actors and this is not very controversial within Indian society). These invaders became the Kshatriya military caste, and the Brahmins became their spiritual apologists and enablers. (The Kshatriya were also the one major caste that was allowed to eat meat to build up muscles. Quite logical). The darker skinned aborigines had to continue tilling the soil for their new masters. Christianity.proclaimed the spiritual inequality of all men. In fact it was a very special religion in that it took a very strict line against within-kin marriages in general. Hence why a caste society or anything resembling it is pretty much impossible under Christianity as long as everyone is considered a fellow Christian. (Whereas caste is inherent to Hinduism). Nonetheless we learn that even a millennium after the Norman invasion of Britain people with Norman surnames such as Darcy, Percy, Baskerville and Mandeville are still on average richer than Anglo-Patels like Smith, Mason and Cooper. Nonetheless British society as Western Europe in general traditionally considered itself as one organic society with only small groups of “service nomads” like Gypsies (peddlers, fortune tellers) and Jews (moneylenders) outside it. In India basically the entire population appears to be composed of “service nomads” who belong to their own groups and exchange services with other groups. The Vaishya are traders and artisans; The Shudra are farmers; the Kshatriya are warriors; the Brahmins are priests and scholars. Their religion is what binds them together and keeps the whole thing flowing, hence why it is not opposed even by those ostensibly disadvantaged by it. 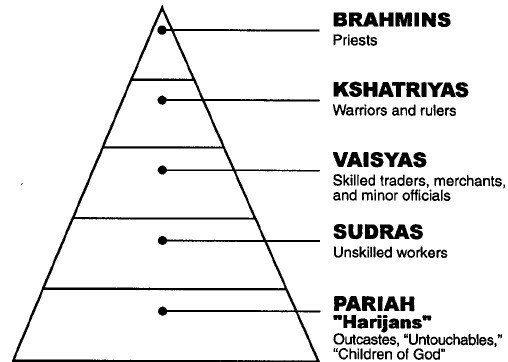 Over several millennia of this caste society operating, in which different castes hardly ever intermarried, you got a plethora of distinct populations that were adapted to their particular divinely-appointed task in life. In practice this meant a small subsection of Ashkenazi Jewish-like Brahmins with very high IQ’s; and a huge mass of peasants with genetic IQ ceilings somewhere in between those of Europeans and Negroids. (I would also hypothesize that after the coming of medical modernity this makes for a bad dysgenics situation because Brahmin families will probably have far lower fertility rates than say Shudra, so their share of the Indian population will dwindle; in contrast, homogeneous European and East Asian populations would appear to be more insulated against dysgenic trends because in those societies dysgenics only occurs via lower IQ segments of the population having more kids, while in a place like India – or increasingly multicultural America/Europe – not only lower IQ individuals have more kids but also lower IQ population groups). So my estimates: (1) India’s current IQ is in the low 80’s; (2) The Flynn effect could yet bring it up to perhaps the low 90’s if India successfully develops (in China the gap is about 5 points but China is of course far richer now and eats far more meat); however, successful development is much harder than in China because starting point IQ’s are far lower. 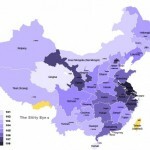 We can expect India to continue growing and gaining on the developed nations but at a pace that will never match China’s; nor, barring technological revolutions (brain-computer interfaces, etc), will it feasibly ever develop to the levels of majority East Asian or European societies. India will continue benefiting from an extremely intelligent and culturally creative but also very small intellectual upper class of Brahmins. Unfortunately much like Jews they cannot be expected to be all that loyal to the Indian nation (to the extent that an Indian nation exists).